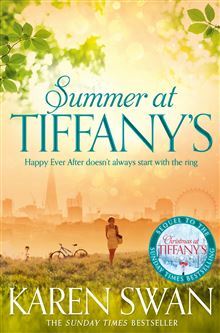 Summer at Tiffany’s is published by Macmillan. Both paperback and Kindle versions will be published on 2 July 2015. 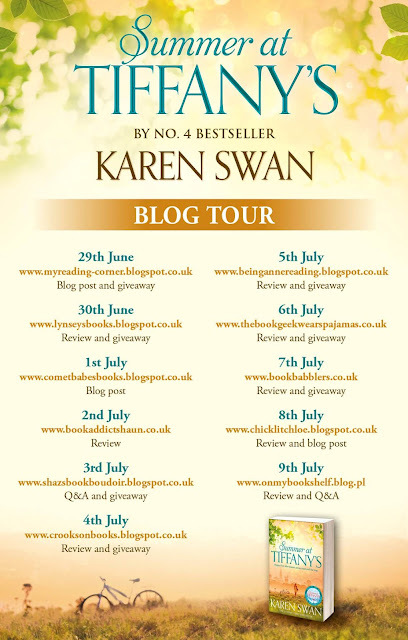 I’m delighted to be starting off the blog tour for Summer at Tiffany’s and now welcome Karen to the blog to tell you why she chose Cornwall as a setting for the book. At the end of this post, there is a giveaway for 3 winners, each to win a paperback copy (sorry, but entries are restricted to UK only). The winners will receive their book direct from the publisher. The tour finishes on 9 July – please do check out the other blog stops. Why I love Cornwall and couldn’t resist partly setting the novel there. For me, retreat and renewal isn’t a marble palace in Dubai where I can get my nails done; it’s a chunky, rough lime-washed cottage with six foot-deep walls, granite lintels and a black slate floor. I want to climb over serpentine rock and run barefoot along grass-fringed sandy paths, I want the wind to whip my hair into knots and burn my cheeks so that I go home blown-through and giddy; I want to feel like a child again, care-free and guileless. I want texture and colour and to somehow physically grab hold of this piece of England which doesn’t prize the manicured and manufactured over the raw and fresh. The very culture of the place is steeped in heritage and endurance, resilience and independence and given that in all my stories, my characters are – in various ways – being stripped back and rebuilt again, it’s an obvious and perfect setting. In this book, Cassie is forced to ask herself what she really wants, even though she’s supposedly already got her happy ending. Does she truly know herself or is she clinging to an idea of how she thinks life should be? Cornwall’s wildness and tempestuousness was a great metaphor for the passions and conflicts still lurking in her heart. A wedding to plan. A wedding to stop. What could go wrong? Henry’s wild, young cousin, Gem, has no such hesitations and is racing to the aisle at a sprint, determined to marry in the Cornish church where her parents were wed. But the family is set against it, and Cassie resolves to stop the wedding from going ahead. When Henry lands an expedition sailing the Pacific for the summer, Cassie decamps to Cornwall, hoping to find the peace of mind she needs to move forwards. But in the dunes and coves of the northern Cornish coast, she soon discovers the past isn’t finished with her yet? It does Julie. I still have mine to read but looking forward to it.